You don’t need other fancy ingredients to make good lamb sing. 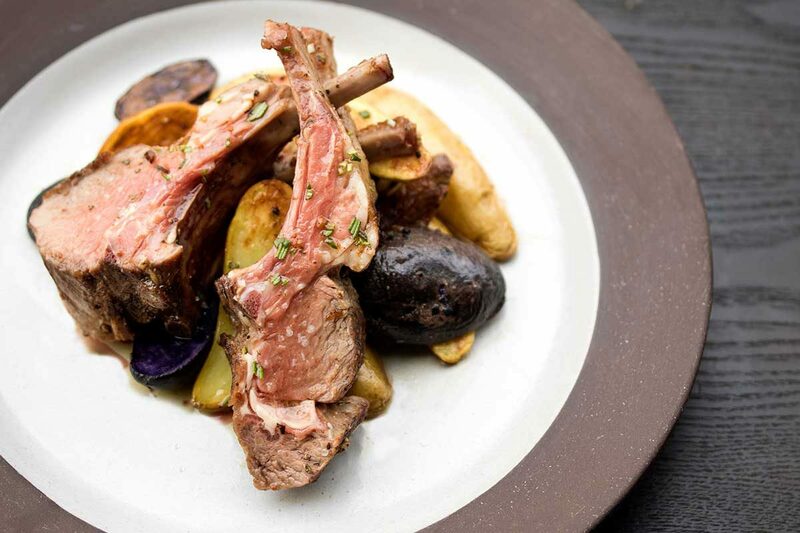 This lamb rack recipe is fairly simple, but utterly luxurious. We’ve seared & roasted the racks here. If you prefer, the lamb racks in this recipe can instead be cooked sous vide with salt, pepper, olive oil, and rosemary at 120°F for 2 hours, then finished by butter basting & searing in the frying pan. Cut the fingerling potatoes in half lengthwise. Toss them with salt, pepper and olive oil. Cover a baking sheet with a sheet of parchment paper and spread the potatoes out on the paper. Season the lamb racks with salt & pepper. Roast them in the oven to an internal temperature of 120°F. Roast the potatoes at the same time, until they are tender. In a large frying pan, melt the ¼ cup of butter with the high heat oil over Medium High Heat. Add the garlic & rosemary, swirling to combine it with the butter. Add the lamb racks to the pan & sear them in the flavored butter, basting them. Turn the pan so the pooling butter is off the direct heat, scooping it over the racks & turning them as they brown. Remove the lamb racks from the pan to a clean plate to rest, loosely covered with foil. Deglaze the pan with the white wine, scraping off any browned bits sticking to the bottom. Simmer the wine until it reduces by half. Pour any juices that have collected on the lamb resting plate into the wine sauce. Taste it and add salt and black pepper as necessary. 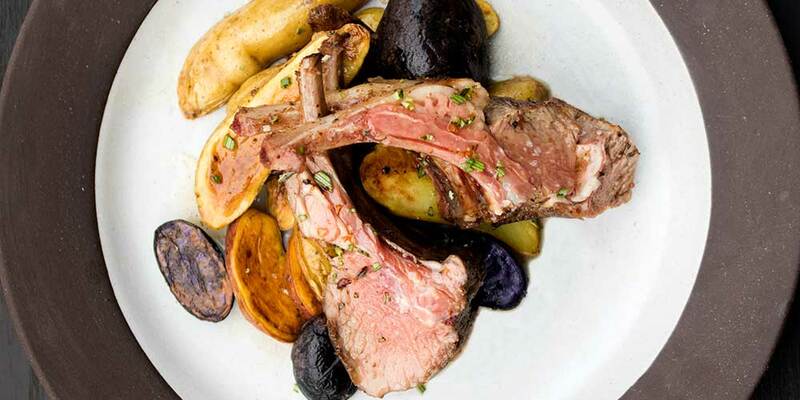 Slice the lamb racks into single or double chops. Plate them with the potatoes & the wine reduction sauce. Sprinkle them with a little minced fresh rosemary & serve.